An early look at top Northwest teams. The Bellingham Invite is the traditional finale of the preseason for top Northwest Women’s teams, as they gather on the campus of Western Washington University to work out the kinks before diving into the regular season. This year, the field featured #6 British Columbia Thunderbirds, #7 Oregon Fugue, #12 WWU Chaos, #25 Whitman Sweets and unranked Victoria Vixens competing in a one-day round-robin. Notably missing was #16 Washington Element that passed up Bellingham in favor of preparing for the Santa Barbara Invite. The day started off near 40 with a nipping breeze, but the wind eased and the sun came out making conditions balmy by afternoon before cooling again into the evening. Teams took advantage of the unsanctioned event, and they all played open lines, providing lots of reps for their rookies against strong competition. British Colombia (4-0) went undefeated to repeat as Bellingham Invite Champions. The most highly anticipated match-up of the tourney was their third round game vs Oregon. UBC took advantage of some sloppy Oregon play to quickly go up a few breaks and extended their lead to 10-5 by the time hard cap hit. Ellen Au-Yeung played relatively sparingly, as did Janelle Siwa, while their fellow fifth year Naomi Morcilla was absent. There was clearly a new look to the Thunderbirds, as many of their most impactful players from 2018 exhausted their eligibility. In their place, UBC has a big crop of rookies, many from Team Canada and the rich Vancouver youth scene. The standout was Crystal Han, who was consistently effective downfield and made the play of the tournament, laying out in the far endzone while toeing the sideline for the goal to seal half. Many other rookies had solid debuts, but more notable were last year’s underclassmen taking on much bigger roles. Monica Hsu, Samantha Roche, Denise Su, and Akaya Blair all stepped up to take many of the backfield touches for UBC. Like years past, UBC’s strengths are depth and speed. One of their favorite ploys was for cutters to make hard in-cuts and, if those were defended, streak deep. Handlers didn’t hesitate to put up floaters, trusting their teammates to put on the jets and chase the disc down. Oregon (3-1) ended up in second place, dominating Whitman and Victoria, while holding on versus Western Washington in the showcase game to win 11-10 in hard cap after being up 8-4 at half. As expected, Ella Hansen, Morgan Caldwell, Maddie Boyle, and Rachel Hess played key roles. However, Kaiyana Petrus and Emily Fagan were sidelined. As with UBC, last year’s newer players have stepped into larger roles. Natalie Clifton was often a primary look downfield, while Amy Turner and Shea Davis got lots of touches in the midfield and Takisha Tarvin was a decisive cutter and launched a few hucks of her own. The most notable rookie for Oregon was Evelyn Reding, who made some big plays on defense, but she and the other rookies appeared to still be working on syncing with the Fugue offense. Western Washington (2-2) looks like a strong contender this year, returning a deep team led by Samiya Ismail and Maddie Gilbert. Their most impressive game was versus UBC in round four. After giving up a break to open the game, they broke back and traded holds to lead 7-6. At 7-7, each team had several chances to score, but UBC finally broke and extended their lead to 9-7 with a hold out of half. However, Chaos broke to tie the game at 10 before UBC held and broke to clinch the Bellingham championship 12-10. The breakout player for Chaos was senior Macy Schelbert, who made numerous big plays downfield (both layouts and skies) while also looking solid in the backfield. Also stepping up were juniors Eleanor Heberlein and Riley Taur, along with sophomore Vail Dark (who enjoyed the biggest cheering section…”Hail Vail!”). Whitman (1-3) certainly has a new look this year, featuring 13 rookies. With their juniors just returning to ultimate after spending the fall abroad, Whitman was still clearly figuring out how to work together on offense. But even against the top teams, Whitman’s pressure defense generated multiple turns. Versus the top three they had trouble converting their D-line chances, but they put it together versus Victoria, dominating to the tune of 15-4. Notable among their rookies, Kaia Roast was reminiscent of the second coming of Margo Heffron—a six foot handler with picture-book throws. The other rookie standout was Mira Anderberg, who complemented Roast in the backfield with strong upline moves. Those two rookies in the backfield, alongside Hannah Filley and Akane Kleinkopf, allowed Chloe Caruthers-Liske to move downfield alongside Mackenzie Timbel, while Liv Amorosi was sidelined recovery from knee surgery. With new coaches and lots of new players, Victoria seemed outmatched. They battled hard but had trouble maintaining the offensive consistency needed to score via the strong defenses of the rest of the field. It will be interesting to see how they develop over the course of the season. 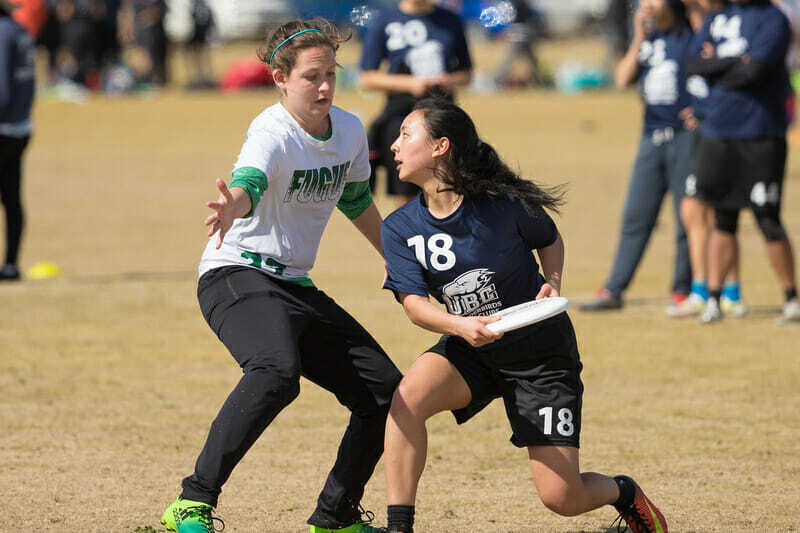 Comments on "Bellingham Invite 2019: Tournament Recap (Women’s)"